There are two types of players when it comes to single-player games. There's "the casual", being selective with their free time to play, usually jumping between different games. Then there's "the committed", being dedicated towards completing an adventure, refusing to switch discs (or digital downloads) until they've experienced everything it has to offer. 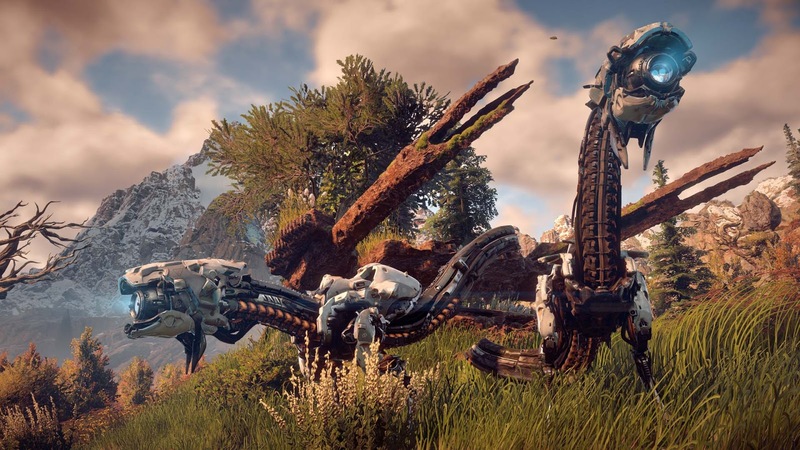 PlayStation 4 exclusive Horizon: Zero Dawn converts anyone classed as the former into the latter. 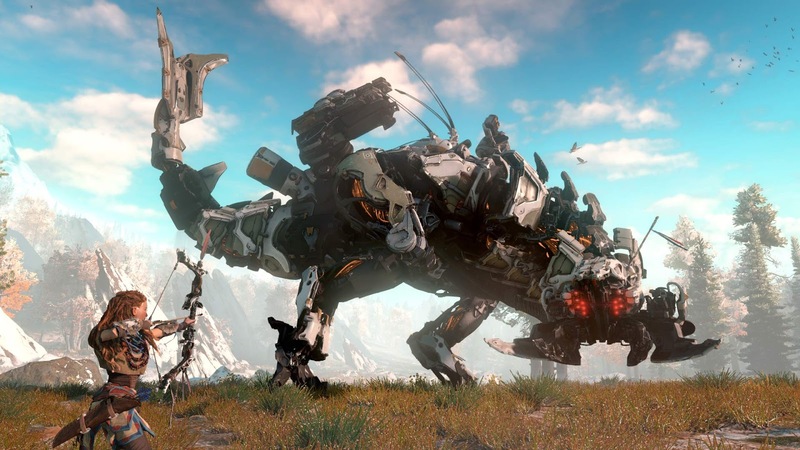 Whilst gaming is all about escapism; usually through compelling narratives or entertaining gameplay, Horizon accomplishes both to the highest potential and achieves it through a well-crafted marriage between the two. After finally earning the Platinum trophy (basically doing everything), I was left with a feeling of sadness, knowing it was time to finally leave this definitive gaming experience. Modern human civilization is no more. 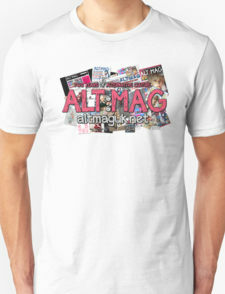 After becoming so advanced during the second half of the 21st Century, the machines rose up to take over. They won. The human race was almost extinct. Over 1000 years later, the earth still stands with machines roaming it's lands, but now in the form of metallic, animal-like creatures. Humanity thrives but have reverted back to living as native tribes, fighting with bows and arrows, hunting the robotic beasts for sport and harvesting their metal components. You play as Aloy. Believed to have been birthed from the inner workings of a mountain (yup), she was sent to be raised outside of the tribe, growing up to be a red-headed warrior woman amongst the outcasts. 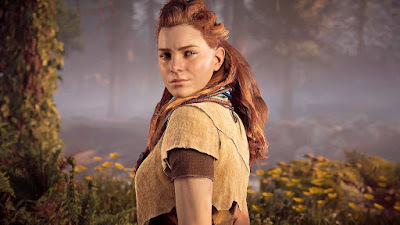 Given the opportunity to prove herself against the prejudice she's met all her life, you follow Aloy on her journey towards the trials of the Nora, combating the evils of mankind and thwarting the hostile machines that once brought the Earth to it's end. 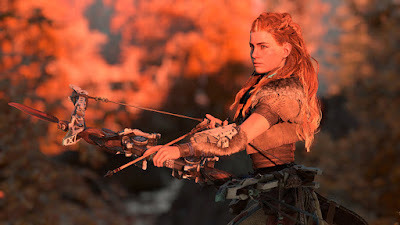 Aloy, the Ygritte of gaming. Whilst being one of the most original stories in years, Horizon would be nothing without the beauty and scope of the world it's set in. With only the first-person-shooter franchise Killzone under it's belt, Guerilla Games created an RPG designed with a defined grace. Environments are densely lush and enthralled by varying weathers. Valleys, forests and mountainsides are abound with creatures both live and mechanical. Being put back in control of the red-haired heroine at the end of each astoundingly lifelike cut scene, the urge to stop and pan around the camera to take in each aesthetic is irresistible. All it needs to top if off is a narration by David Attenborough himself. Horizon's gorgeous settings are a base for a gameplay system that allows you to play in whatever unique way you see fit. Missions are efficiently categorised into main, side and errand quests. It allows you to effectively cater to your own style of play, whether you want to go from quest to quest or simply spend long amounts of time exploring the world in between. Even the smaller quests feel like a cinematic adventure as you solve problems and make new allies in this post-post-apocalyptic world, akin to Witcher 3 but with a more manageable quest system on a less intimidating scale. As you venture further into Horizon's fully packed map, the amount of detail and thought that's gone into the creation of each mechanical creature and it's surroundings will never cease to amaze as you continue to discover more. Oh and you get to kill some evil cultists. Neat. When obtaining different weapons, you learn that you need to hunt different machines to use their bodily components for crafting and trading, whether it's to stock up on ammo or to upgrade and modify your gear. For example, one of these weapons, the Blast Sling, fires explosive grenade bombs that use Blaze as one of its components. If you're running low and don't wish to spend shards (in-game currency) on a merchant, you can go hunting for creatures such as Grazers, a deer-like machine that houses Blaze canisters on its lower back. 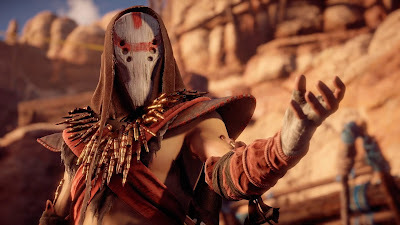 Hunting is a part of what's most fun about Horizon: its combat system. When you can be in the line of sight of a hostile enemy when you least expect it, fighting is a fast-paced balance between strategy and thinking on your feet. With the standard goal of damaging your opponents until their health bars drop to zero, you're constantly educating yourself the more you fight: how each creature moves before attacking; which weapons do more damage to certain types of foes, what combinations of elemental ammunition work best and of course, what are the most practical strategies when you take all of this into consideration. Take a Thunderjaw, the largest and most powerful amongst the animalistic machines, whose design is based on predatorial dinosaurs such as the T-Rex. Using your unlockable hacking ability, you can take control of other machines to take the brunt of the fighting for you. 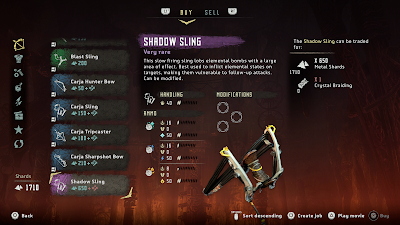 Then utilizing your Focus, a key tool of the game's user interface, you can identify key weakpoints on the large enemy, targeting them with high-precision arrows to secure the finishing blows. Then you've got Glinthawks, the airborne mechanical vultures that launch freeze blasts at you from a distance. Shooting them down with standard arrows can be a real challenge. Either blast off its parts with soundwave-based terrablast arrows until it falls or tie it down with your Ropecaster, leaving it struggling against the ground and vulnerable for a final close up attack from your spear. Horizon continuously tests your skill and prowess by throwing different enemies and scenarios at you, always keeping each encounter unique and fresh. 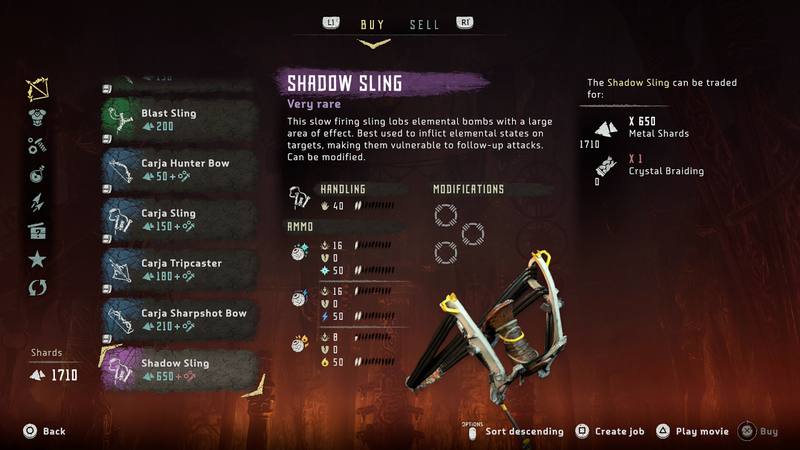 The weapon pin wheel, allowing you to pick your favoured bows, slingshots and tripwire casters for quick use, lets the adrenaline-fuelled rush of combat go uninterrupted. Even the sound and feel of your heavy spear clashing against a foe feels genuine and powerful, giving a close fight an intense feel. Gameplay outside the idea of pointing and shooting a gun is a new concept for Guerilla Games, but perhaps creating an in depth combat system with such a fresh set of eyes is why the end of each brawl made me want to go back for more. 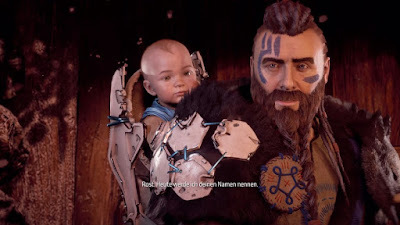 Feelings of accomplishment over attacking machines and human bandits are two-fold because of the linked growth between Aloy and the player. We meet her as a baby and then a child, where events create a curiosity for both you and herself about the past, its people and the technology that came with them. Jumping forward to her 18-year old self who we play as for the rest of the game, that interest is only elevated. She's never explored the world before. As you're filled with that sense of wonder when discovering something new, she's in the same boat. 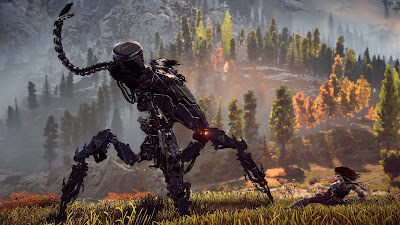 Played perfectly by Ashley Burch (Borderlands 2, Steins;Gate, Attack On Titan, Life is Strange), Aloy carries herself with the confident bravado that one should when tasked with stopping Skynet with robot dinosaurs. However, she still rightfully showcases the vulnerability that an 18-year old carrying such a burden should. Horizon conveys to you, the player, how any normal person would feel when faced with so much at stake based on your actions, even in this crazy reality of blasting away metal birds with a slingshot. This is emphasised by the wonderfully deep lore that only enhances your thirst for answers. Let's not forget that Horizon is in a universe where humanity achieved technological feats similar to what we believe can be achieved in the near future, all before it led to its end. Man kind of the 21st century is a vague mystery similar as to what we think of the Ancient Egyptians or the Roman Empire. As Aloy uses what's deemed to her as ancient technology to find out more about herself and the rest of the world that came before, each discovery carries a punch of emotional weight that stays with you given the dynamic structure of Guerrilla's storytelling. Even for players who hate grinding for collectibles, small euphoric bursts of joy will be felt whenever coming across an audio file or note from the 2060's, knowing that you're about to become just a little more invested into this world with each find. In 2011, Netherlands-based developer, Guerilla Games, decided to create something out of their comfort zone: an enriched RPG of an entirely new intellectual property. Even though it was risky, they wanted to move forward away from the danger of stagnation and enhance the range of experiences they can offer gamers. Horizon: Zero Dawn is the result of that profound respect for gamers and the industry it's part of. It's a cocktail of invigoratingly fun combat, thrilling visuals, enriched with unforgettable story and lore. 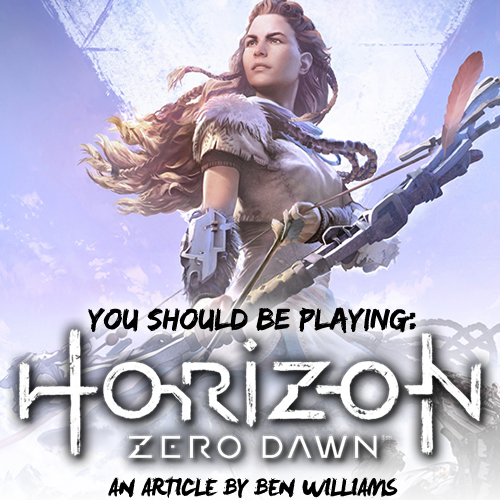 2017 marked the release of many critically acclaimed titles but Horizon embodies something for players in every genre, housing the magic of escapism that a great video game should contain. When opening the menu for the first time, the sombre yet blissful score composed by Joris De Man - an audible mixture of dread and hope combined - will have you saying (for the first of many times): "this is art".